written by Imran Raza on June 25, 2018, 7:31 p.m.
Second Cup at Cheetay – Bringing you the Ultimate Experience Anywhere and Everywhere! If you have an infamous sweet tooth always making you crave for something sugary then it is time to put Second Cup in your list of favorites. This restaurant has the best desserts and beverages added to its palate but that is not the only food it serves. It has a savory cuisine as well, which includes wraps, pizzas, pastas, rolls and lasagna. What brings this food and its experience out of the restaurant and into your preferred locations is Cheetay - its food delivery partner. Once you have reached cheetay.pk, go ahead and order a Caffe Latte or any of the flavoured lattes that include Caramelo Corretto, Hazelnut, Vanilla Bean, Moccaccino, White Mocha, Butter Nut and Maple Latte from Second Cup’s menu. If you like, then get a taste of Nutella Molten Cake or a Chocolate Croissant along with it and enjoy its delicious taste. A fan of chocolate and Nutella can order online for a Signature Hot Chocolate along with deep flavoured Fudge Brownie or hazelnutty Nutella Brownie. To enjoy your coffee time even more, get a Cappuccino with sweet Strawberry Swirl Cheesecake or rich heavenly Chocolate Cheesecake. If you scroll further down on Second Cup’s food menu, you will see that this coffee shop has frozen desserts, parfaits, muffins and shakes to gratify your taste buds. Frozen favourites have Frozen Hot Chocolates, Icepressos (Cold Coffee), Chillers or Handcrafted Italian Sodas to give you fruity, smoky, vanilla-like taste while rich creaminess and custardy flavors can only be tasted through Parfaits. These come in Mixed Berry, Granola & Honey, Strawberry Banana, Chocolate and Caramel essences. If you like frothy shakes more than the velvety parfaits then get these in Mocha Mania, Cookie Crumble, Berried in Caramel and Dreamsicle Lite flavours. If you think that these shakes are too heavy for you then try their range of fruity smoothies consisting of Berry Passion, Strawberry Banana, Clementine Mango and Caramel Temptation. Do you know that Cheetay can help you buy Second Cup’s coffee beans online? 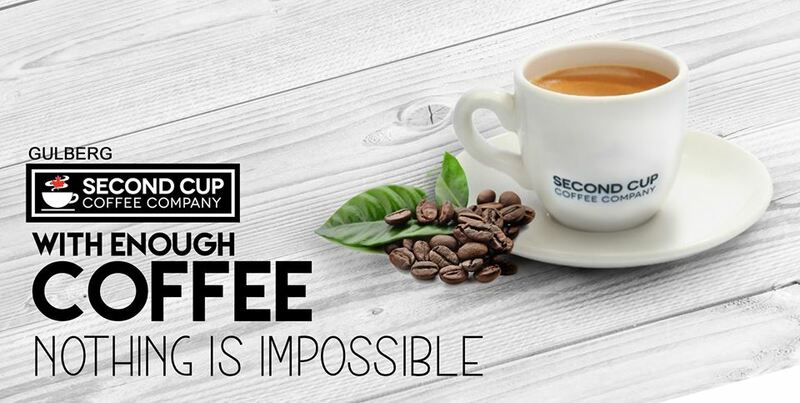 Get Paradiso Dark, La Minita, Colombian San Agustin, Sumatra Mandheling, Cuzco, Paradiso Dark Swiss Water Decaf or Paradiso from Barista Crafted Perfect Cup option in the menu and enjoy a delicious cup of coffee every day at affordable Second Cup coffee prices! For those who do not like sweets can have a sandwich filled with Chicken Tikka, Chicken Teryaiki, Chicken Bbq, Chicken Club, Grilled Chicken, Salsa, Sub Tandoori Grilled, Chicken Fajita Sandwich or Chicken Turkey. You can also have a Chicken or Jalapeno Kebab Wrap, a Chicken Pizza Slice, Alfredo or Peri Peri Pasta, Lasagna, Chicken or Kebab Croissant and Cheese Roll or Chicken Tikka Turnover (Patties) with coffee. Whether it is coffee, desserts or savoury dishes, Second Cup Lahore at Cheetay will never disappoint you! So, start ordering online now and eat to your hearts’ content.